I think this is the only way you could get me to eat an mushroom! It looks delish!!!! Seriously?! Again?! Girl, your recipe ideas are literally out of this world… this looks soooo good! I am so down with this. For one, the brown sugar balsamic portobellos sound incredible, but stuffing with with mac and cheese? Too good to be true. Love it! Meatless Mondays have no become everyday thanks to your recipes! The only thing I can think of is stuffing this into those biscuits you made a few post ago or burger. I am such a sucker for portobellos, and that mac and cheese makes the whole thing cozy. Such a perfect Monday recipe. I will be serving these at my next poker game. Whaaaaat!?!??? This is crazy!! And I love it – happy Monday Jess! Omg. I’m going to lose my mind if my phone doesn’t let me finish what I’m trying to say. Anyway… This has my name written all over it. Carbs are my happy place. Like I could dive straight into them and live there forever. mmmm love mac n’ cheese! and intrigued by the idea of putting them on portobellos. OMG – this looks insanely delicious! I will be making this soon. Great idea! Brown sugar balsamic portobellos sounds fantastic then add mac and cheese. Oh my – I need to make this. YUMMM! You had me at Mac + Cheese Stuffed. Don’t you love it when life’s big question is what to do with too much mac n cheese on your hands? Genius idea! I made that mac & cheese for my husband and it was a HUGE hit. Love this repurposed version! Perhaps this is the way to get my mushroom hating man to enjoy some fungi with me. I mean, if not I’ll just be left with more mac and cheese stuffed shrooms for mah self. WIN. If I didn’t want to marry you beforehand, I do now. This is the best thing I’ve ever seen. Everything. I. Love. Is. Right. There. So. Yeah. Ooooooh, that marvelous burnt cheese from the Stouffer’s mac… how I miss it. These stuffed mushrooms will certainly do as a replacement, though. YUM. I have never seen that before!! Super creative! Such a good idea! Now I can eat a boatload of macaroni and cheese and it’s totally ok ’cause there is vegetables. Totally disqualifies all the cheese. Win! Ummmm. Maybe this would make Chris a mushroom lover? It’s just got to. This is blowing my mind right now! Finding new ways to make mac n cheese always makes for a good day. Just awesome. The brown sugar balsamic portobellos is where it’s at for me. They look incredible and I would go to town on them! Dont even need the mac n cheese, just those! And I knew you had a lot of mac n cheese recipes but it’s amazing seeing all those links in the last paragraph! Wow these look to die for. I haven’t had portobellos in a while, but I just might have to pick some up and make this recipe. I love your wild and crazy food ideas when this is the result. :) This looks amazing! I want to eat it right off the screen! Will definitely be trying this soon…. I thought I was the only one who was happy to get burnt cheese with their microwaved Stoffer’s mac and cheese. I actually did this on accident the other day with my Trader Joe’s mac & Cheese….pure bliss. ooooh so delicious. love garlic bread crumbs. sounds amazing. This may be a cop out recipe but it is a delicious one! Wow, what an incredible combination. This would be a hit at a party! Who thinks to stuff mac n’ cheese in a mushroom? Bloody brilliant! I dig this in a major way – LOVE. You can stuff a portobello with pretty much anything and I’ll love it, but this?! Freaking genius. I love plain old mac and cheese, but I love it even more when it’s trashed up. Especially with mushrooms! I mean, that mess of pasta and cheese is just a blank canvass for other delicious things. How can you resist? Yup, you’re brilliant. Who knew mac and cheese could be improved? 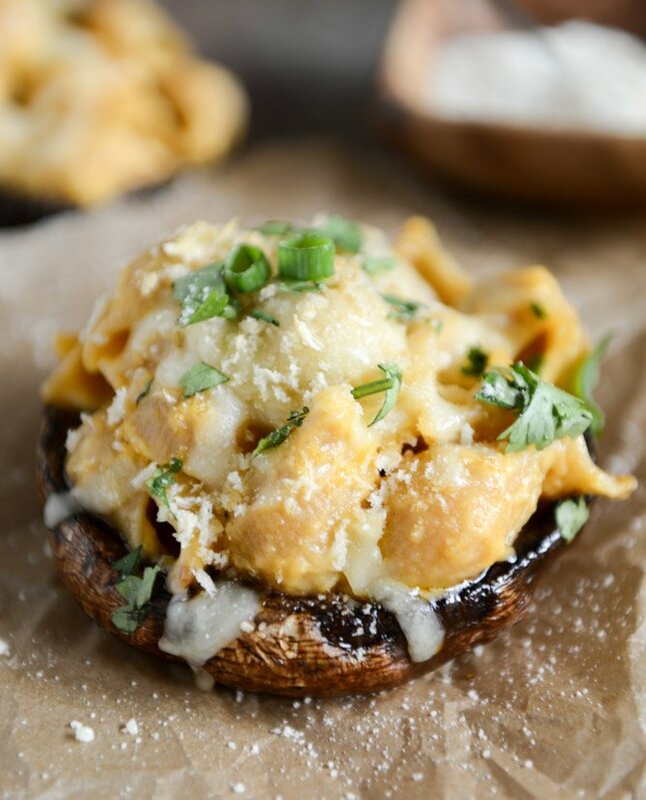 Mac and cheese stuffed mushrooms may just be one of the best ideas ever!! Oh my goodness, this sounds absolutely amazing! I love my stuffed portabella’s, but you just took the crown with this recipe… thanks for sharing! Amazing! I love the way you combined 2 things I love, mushrooms and mac & cheese…. yum! Perfect! Hello dinner! These look amazing! I don’t even like mushrooms and I would totally eat this. Especially with that blue cheese macaroni you linked to up there…ohmyyes that’d be perfecttt! oooh mushrooms! How did i forget about mushrooms? I kind of wish i had this and a beer right now. Maybe i’ll enjoy it on the beach in MEXICO next week … eeek can’t wait.